2015 has proven to be a fantastic year for fans of eighties genre films. Not only did we get Mad Max back in the blockbuster hit MAD MAX: FURY ROAD, but a number of (much) lower budget films have been released that show a real love and understanding of the films of the Reagan era. And as anyone who was a teenager in the eighties can tell you, one of the most ubiquitous genres of the time was the slasher movie. We’ve already had one good retro slasher this year in LOST AFTER DARK, which took a fairly straight forward approach in creating a film that could believably pass for a lost 80s relic. 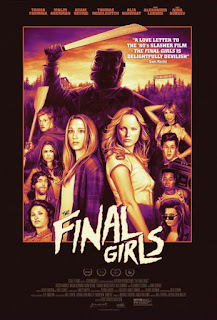 Now we get a more meta, and surprisingly emotional, take on the genre with Todd Strauss-Schulson’s THE FINAL GIRLS. The clever screenplay by M. A. Fortin and Joshua John Miller begins with modern teenager Max (Taissa Farmiga) offering moral support to her actress mom Amanda (Malin Akerman). Work hasn’t exactly been steady for Amanda, and she complains to her daughter that part of the problem is everyone recognizes her from the cheesy slasher movie she made in the eighties, CAMP BLOODBATH. While Max and Amanda are coming home from an audition, Amanda gets distracted and another car slams into hers. Only Max survives. 3 years later, Max is being tutored by high school hunk Chris (Alexander Ludwig), whose ex Vicki (Nina Dobrev) also used to be Max’s best friend. Rounding out the rest of the main cast are Max’s new best friend Gertie (Alia Shawkat) and her step brother, horror movie nerd Duncan (Thomas Middleditch). Duncan is organizing a showing of CAMP BLOODBATH and its sequel, and wants Max to be the guest of honor at the screening. Reluctantly, and only after being offered a bribe, Max agrees. Things go awry at the screening, though, when a fire breaks out. The exits are blocked, but quick thinking Max grabs a prop machete dropped by an audience member and slashes through the screen, believing it will lead to a back exit. Instead, Max and her friends wind up inside the movie CAMP BLOODBATH, stuck in a perpetual 92 minute loop. Duncan suggests that if they just stick with the film’s final girl Paula (Chloe Bridges) until she dispatches the Jason-esque killer Billy (Dan B. Norris), they’ll be able to exit the movie. Things don’t go exactly as planned, though. I don’t want to give away too much more of the plot, but suffice it to say there’s some awkwardness on Max’s part being around Nancy, the character played by her mother. Even though Max knows Nancy is supposed to die in the movie, she starts to believe there might be a chance to save her, and by extension a second chance to save her mom. It’s from this aspect that the film draws much of its pathos. But wait, there’s more. Namely comedy. Without exaggerating or winking at the audience too much, THE FINAL GIRLS does a superb job of sending up slasher film clichés. Adam Devine in particular shines as requisite horndog dude Kurt, dropping one inappropriate and idiotic double entendre and innuendo after another. The film does an admirable job of balancing comedy, horror, themes of loss and acceptance, and fantastical movie within a movie elements. About the only real missteps it makes are in telegraphing the initial accident way before it happens, and in having the movie house fire started by a patron smoking. Let’s be honest: these days, you’d have a better chance sneaking a gun into a movie theater than lighting up a stogie. It kind of undermines the idea of having the main characters step from “reality” into a movie when reality feels a bit phony itself. But really, that’s a minor gripe. All in all, this is a really fun, smart, funny, and at times touching film. 3 out of 4 stars.